The Weight Loss Village Diet is an online program that seeks to give dieters all the tools and support they need to lose weight and keep it off. They believe when dieters can change those four things for the better, weight naturally comes off. No matter which meal plan is chosen, Weight Loss Village generates that weekly meal plan as well as a grocery list needed to follow the chosen meal plan. Their technology also allows dieters to customize their meal plans to include the foods they love and exclude foods they don’t like. Although dieters are free to use the meal plans however he or she may like, Weight Loss Village suggests that dieters follow their 3 Phase approach. Phase 1: Detox & Cleanse phase using one of their 14 or 21 day detox meal plans. Phase 2: Weight Loss Phase using one or more of the other 40 meal plans. Phase 3: Lifestyle phase with continued support that continues to incorporate healthy eating and positive thinking. A mobile app to take Weight Loss Village anywhere. There are a large variety of food choices because of the many meal plans available, over 13,000 food and beverage choices to be exact. In general, meal plans promote foods low in saturated fat, low in refined carbs, and high in fresh fruits and vegetables. Their online system includes a wide range of activities so that dieters can track calories burned as well as suggestions of new exercises to try. The Weight Loss Village Diet believes dieters should move more, but in ways they enjoy. Weight Loss Village offers the initial weight loss profile for free, but if dieters choose membership this averages to about $7.50 per week, billed in 13 week increments. A wide variety of meal plans to choose from. Addresses emotional causes of overeating. 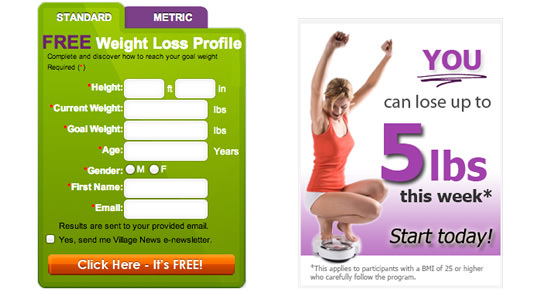 Many tools and weight loss support included. Plans focus on nutrition and not just weight loss. Recognizes the importance of positive thinking. No fitness experts on their coaching panel. Some dieters may require a more “in person” support approach. Cooking and meal preparation is required. Overall, The Weight Loss Village Diet provides dieters with a really comprehensive and balanced approach to weight loss. Its 46 meal plans and grocery lists take care of the biggest obstacle in losing weight, knowing what and how much to eat using food choices that are enjoyable to eat. In addition, their Thinking Thin Workshops help dieters to change the way they think about food as well as themselves.